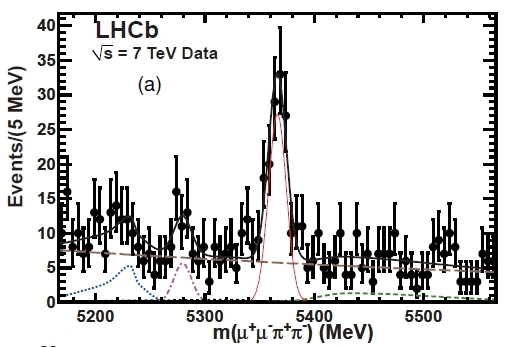 LHCb Observes Bs Decays To J/psi F0 Pairs! 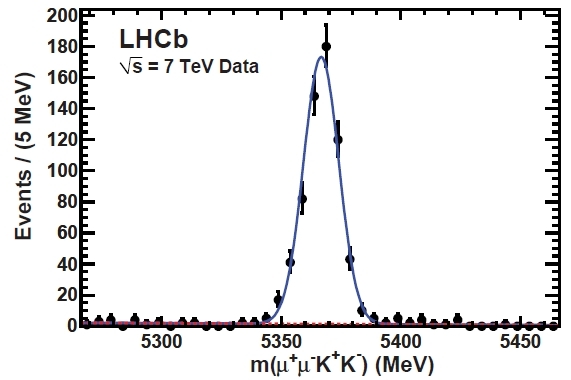 A recent paper in the arxiv describes the observation, in 7 TeV proton-proton collisions produced by the LHC collider in the core of the LHCb detector, of a new decay mode of the particle called "B-sub-s", a meson which is a bound state of a anti-bottom-quark and an s quark. B-sub-s mesons are important particles created at high rates in hadron collisions. The heavy bottom quark they contain decays into a charm quark in about a picosecond, giving rise to a rich pattern of possible final states and, more importantly, allowing a very clean separation of backgrounds due to the long lifetime of the decaying state. If one looks at the Review of Particle Properties, one discovers that no less than 13 decay modes of B-sub-s mesons have been identified and measured, plus another dozen which have only been searched and for which only upper limits exist. 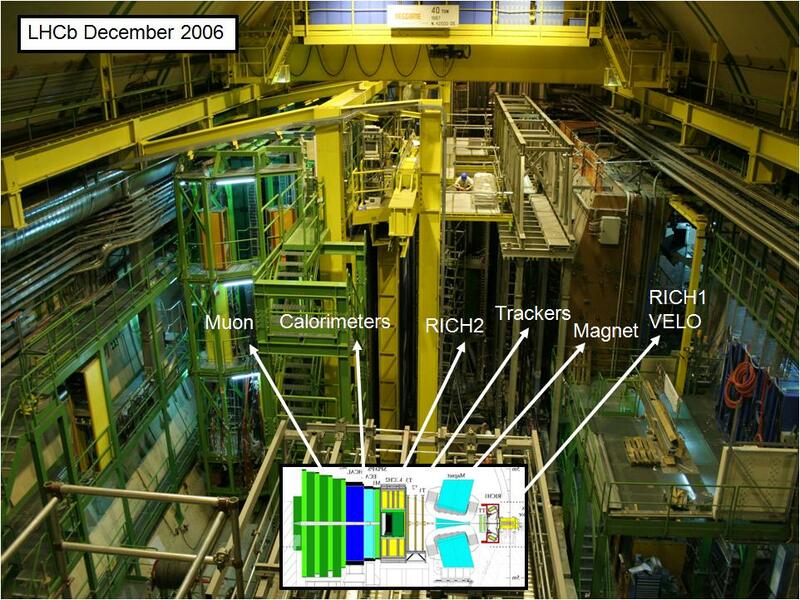 (Above, a view of LHCb with the main systems evidenced and related to a graphical sketch of the apparatus). Many of the decays of B-sub-s mesons are important because they allow the study of possible asymmetries in the phenomenology of these particles. In particular, the decays involving a J/Psi meson and a phi meson, , proceed through two different interfering amplitudes, with a resulting CP-violating effect. Mind you: this CP violation effect is predicted to be extremely small, much smaller than others in the phenomenology of B hadrons. This, paradoxically, makes it interesting, because new physics processes might enlarge the effect significantly with respect to Standard Model predictions. At LHCb, which analyzes only the forward part of the hadron emission in the LHC proton-proton collisions, B_s mesons typically travel at high speed, and are thus easy to distinguish by looking at the common vertex from which the charged decay products originate. It is this huge advantage, combined with the large rate of production of B mesons at small angle with respect to the beams, what puts LHCb in the position to study better than the other LHC experiments the physics of the CP-violating phases of B_s mesons. And now the observation of a new decay mode which is sensitive to the same CP-violating phase as the decay mentioned above increases the reach for new physics. The decay which was searched and found is the one producing, in association with a J/psi meson, not a phi particle (a bound state of a strange and an anti-strange quark) but a f_0 hadron, a particle with a mass of 980 MeV which has the same quark content of the phi (a strange-antistrange pair), and which primarily decays to charged pion pairs. So the process is : the J/psi decays to a pair of muons, and the final state includes four charged particles. The Feynman diagram is shown on the right. In order to identify the above process, it is critical to be able to distinguish pions from kaons. Kaon pairs are produced in the decay , a process I discussed some time ago. Here, the separate identification of B_s decays to J/psi phi and to J/psi f_0 final states depends on the capability of the detector to identify these hadrons. Indeed, LHCb is endowed with a performant RICH detector -one which determines the identity of long-lived charged hadrons (pions, kaons, protons) by reconstructing the Cherenkov ring of emitted photons which these particles produce when they traverse a medium with a speed exceeding the speed of light in the same medium. 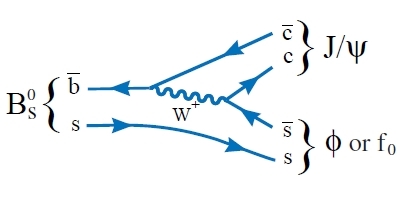 The absence of neutrinos or neutral hadrons makes it easy to reconstruct the invariant mass of the B_s and of the two intermediate mesons, and creates the conditions for a very good discrimination of signal events from backgrounds constituted by random combinations of charged tracks. In the figures below I paste the result of the B_s mass reconstruction in the two final states including a phi or a f_0 meson. Above, the B_s mass obtained from J/psi phi decays. This signal is kept as a "reference" in the search for the J/psi f_0 signal, since it has a larger rate and it is a very similar process to the one sought. Note that these decays are almost background-free, due to the fact that the RICH kaon identification works very well in separating combinatorial backgrounds involving pions (the most copious hadron produced in hadron collisions). The constraint that the kaon-pair mass is within 20 MeV from the phi mass (1020 MeV) also helps to make backgrounds negligible here. For the f_0, which yields pions, the discrimination with combinatorial backgrounds is poorer; the natural width of the f_0 meson prevents as strong a mass constraint from the pion pair as the one used in the case of the phi: the mass window for selecting f_0 candidates in the reconstruction of B_s mesons is 180 MeV wide (i.e. 4.5 times larger). The B_s mass obtained from J/psi f_0 candidates is shown below. Here you see the B_s mass reconstructed from J/psi f_0 candidates. The signal is smaller because the decay involving a f_0 is less frequent (about 20% is the theoretical prediction from the rate with respect to the reference J/psi phi decay). Note that the background includes several ancillary "peaklets" which are due to other decays of B mesons. 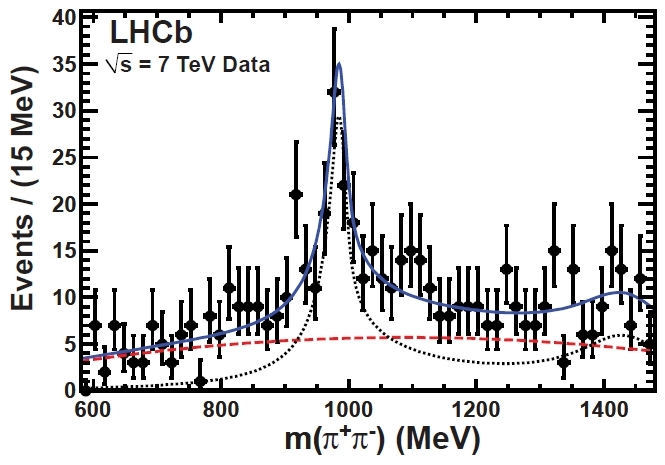 Finally, LHCb shows the f_0 candidate mass in the same events they have flagged as B_s candidates; to do so they release the constraint that the pion pair has a mass close to the nominal f_0 mass, but add the requirement that the reconstructed four-particle invariant mass be within 30 MeV from the B_s mass. This produces the following distribution. The interpretation is clear: there is a nice f_0 resonance, and in addition one can see the faint signal of another hadron contributing to the same di-pion signal from B_s decays: it is the higher excitation of the f_0, which physicists, who have a great imagination and a penchant for creative names, have dubbed f_0(1370). backgrounds that they could be used to measure beta_s without angular analysis." A technical note (which most of you will find useless): Beta_s is the CP-violating phase I was mentioning above. The mention in the quote above is to the fact that in order to dig out a measurement of the CP-violating phase in B_s decays involving J/psi phi final states one is forced to perform an analysis of the angular distributions of the decay bodies; this is due to the fact that both the J/psi and the phi mesons are vector particles (i.e. they carry one unit of spin), and thus they are not a definite CP eigenstate, while the J/psi f_0 is CP-even.